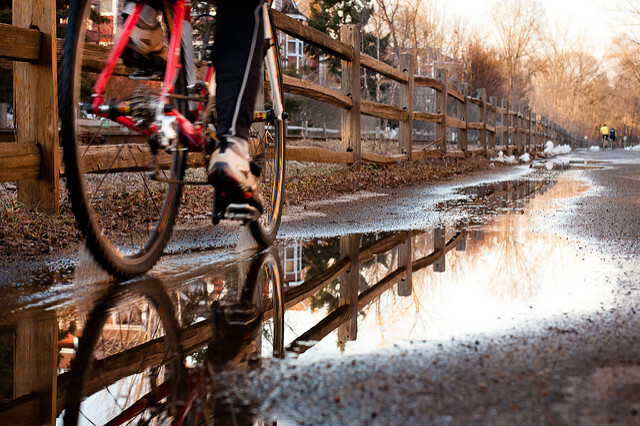 Minneapolis boasts an extensive network of off-street cycling trails. Photo by Matt/Flickr. This week marked the grand opening in Minneapolis, Minn. of the third segment of the Cedar Lake Trail, a now 4.3-mile stretch from the suburb of St. Louis Park all the way to the the Mississippi River downtown. The opening is one more mark on the bench for a city that has invested heavily in an extensive network of off-street trails that have helped make it the most bike-friendly city in the country, according to Bicycling magazine, and a model for other cities looking for the same. The original Cedar Lake Trail was a national trendsetter in that it was the first so-called “bike freeway” that featured bike lanes striped in each direction and a separate lane for pedestrians. The base for this was laid years before, when the city’s early leaders created parks and a “Grand Rounds” national scenic byway that forms a circle of nearly 50 miles of paths around the city by lakes, streams and the Mississippi River. In the 1970s, planners applied a separated trail treatment for biking and walking on park trails that underlies the “bike freeway” concept. Then, in the 1980s, partly at the hest of the “Rails-to-Trails” movement, the city started developing a larger trail network. The first two segments of the Cedar Lake Trail were completed in 1995. The Midtown Greenway, a 5.5-mile crosstown trail, has become one of the busiest greenways in the country. Another trail abuts the Hiawatha Light Rail line. Altogether, the city has nearly 85 miles of off-street trails, with more planned along the north end of the Mississippi and the “missing link” of the Grand Rounds. Minneapolis has also recently developed bike boulevards, on-street bike lanes and segregated cycle tracks, introduced one of the largest bike share systems in the United States, and added hundreds of bike parking facilities. The private sector is also pitching in: the city is dotted with bike shops and bike-themed coffee shops. Private developers have flocked to build compact, walkable housing developments along the Midtown Greenway, and the Minnesota Twins baseball stadium connects directly to the Cedar Lake Trail’s recently opened section. Today the city boasts the second most number of bike commuters in the United States, behind Portland, Ore. It is also perhaps one of the safest places to bike. As bike commuting has risen steadily, crash rates and real numbers of crashes have gone down. In cities around the world, there are unused or underused stream and river corridors, parks, rail and utility corridors and other paths that can be put to good use in providing space for both utility and recreation. There can be obstacles, from funding to pollution to negotiations with landowners, but “there’s a growing recognition from public health and public works facilities that [trail networks] are important infrastructure investments,” as noted by transport planner and landscape architect Steve Durrant in the Minneapolis Star Tribune.